The Trio arrive at Shell Cottage immediately after the brawl at Malfoy Manor, which we know occurred during the Easter school holidays. Easter Sunday in 1998 in the real world was on 12th April: however, shortly before being captured and taken to Malfoy Manor, the Trio were listening to the underground radio-station, and we are specifically told that it was March at that point. So either Easter was on a different date in the wizarding world, or they had an unusually long or early holiday, starting two weeks before Easter. It probably wasn't the last day of March, either, or you would expect that to have been remarked on, although we can reasonably assume that they arrived at Malfoy Manor very late in March. At the end of April or beginning of May (just before the Gringotts raid, which was early in May) Harry thinks of their stay at Shell Cottage as "the last few weeks": if they had been there for well over a month he would surely have thought of it as "the last several weeks" or "the last month or more", so we can say that they arrived at Shell Cottage at the very end of March. So, we know that the Trio's first morning at Shell Cottage was round about 31st March 1998. This is taking us back almost to the Vernal Equinox (March 20th), so sunrise would be fractionally north of due east. 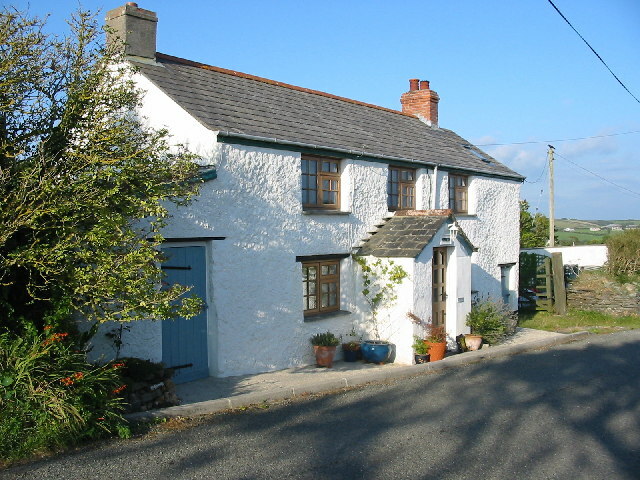 We know that Shell Cottage is near Tinworth, and that Tinworth is in Cornwall. We also know that Shell Cottage is right on the coast, and since Tinworth is near Shell Cottage it too must be on or near the coast. On the first morning at Shell Cottage Harry watches the sunrise, and sees the sun come up in the same direction as the ocean (the window which faces the sea also faces the sunrise, and the window which looks inland faces away from the sunrise). 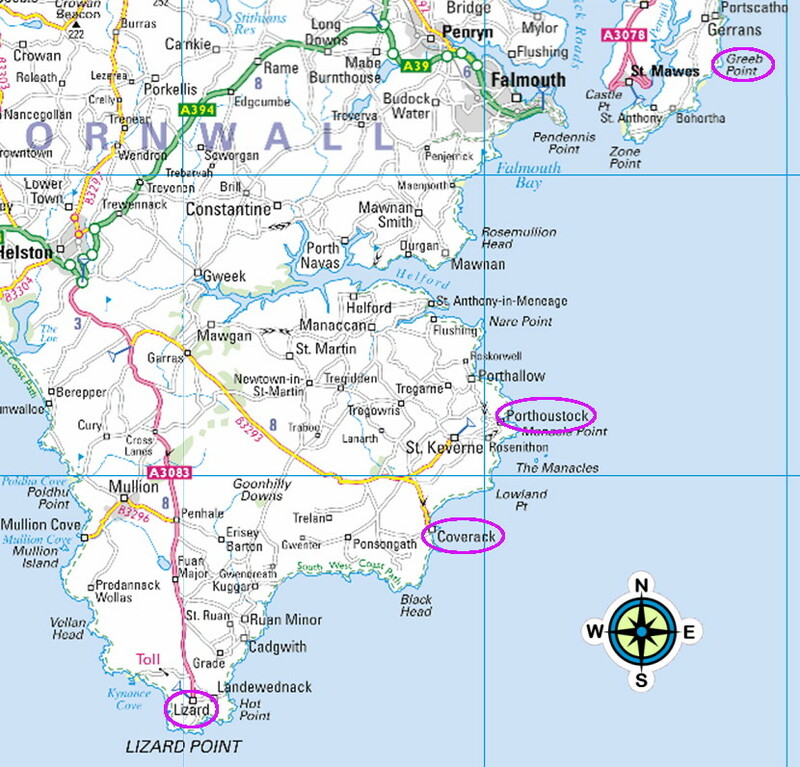 Since the long axis of Cornwall runs from south-west to north-east, this means that Shell Cottage, and Tinworth, has to be somewhere on the south coast of Cornwall: on the north coast of Cornwall, looking east necessarily means looking inland. Nor can it be on the very westernmost part of Cornwall, west of Lizard Point (the southernmost bit of mainland Britain), because there, even if you are on an east facing stretch of shore, you are looking across a bay at more Cornwall. That is, as you faced the sunrise you would be very aware that the stretch of water in between you and the landmass you were facing was a bay, not open ocean, and you would be unlikely to think of it as "the sea" rather than "the bay". So it has to be on the south coast of Cornwall, north-east of Lizard Point and south-west of St Austell, because beyond St Austell the sea is definitely south of you, not even vaguely east. 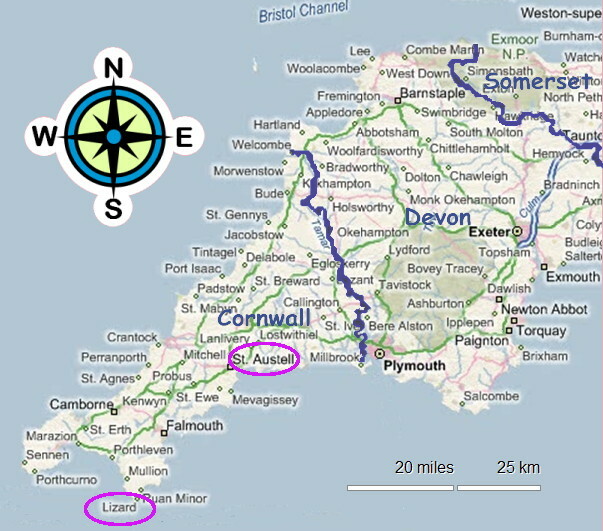 Even between Lizard Point and St Austell, the coast is frilled with scoops and bulges which mean that much of it is facing south or even west rather than east or, like the buildings on Pendennis Point by Falmouth, it's facing east but looking at a south-projecting spur of land instead of open water. Much of it is also quite crowded with towns or caravan parks already. But between St Austell and Falmouth there are stretches of a couple of miles of clear farmland and woods either side of Portloe and of Greeb Point, and on the Lizard Peninsula there's another good clear stretch of coast between Porthoustock and Coverack. These are areas which face east out to sea and where a small extra village could be concealed without having to worry about hordes of people stumbling into or around it - if, indeed, Tinworth is hidden from Muggles other than the ones that live there. About a mile south of Porthoustock, just north of Lowland Point, there's an especially appealing area where the land makes a double drop, from farm level down to a shelf and then down again to the sea, where woods obscure the view from further inland and a small village could conceivably be concealed. If it is concealed it's probably set back from the shore a bit, otherwise the South West Coast Path would take walkers right by it: they must in any case pass close by Shell Cottage. 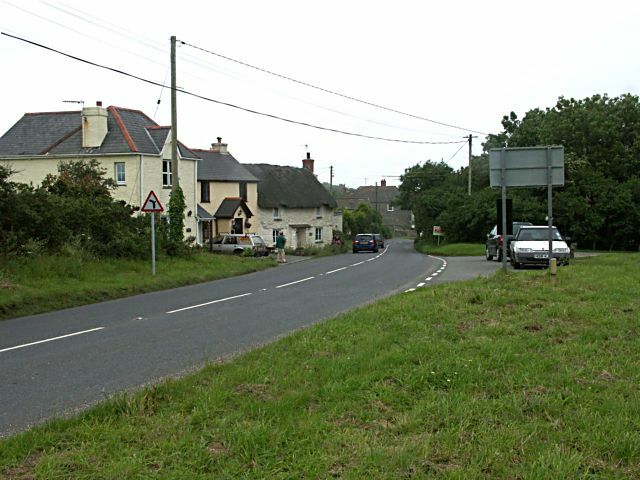 Alternatively, if Tinworth isn't concealed but exists openly and appears on Muggle maps, it could be a corruption of the real-life hamlet of Trewithian, just above Greeb Point. [Trewithian is rather small, described as a hamlet rather than a village - but the wizarding quarter might be unmapped.] If Shell Cottage is near the real-life Trewithian then Harry would see the dark mass of Nare Head on the left side of his field of view as he looked at the sunrise, but about half his view would be open water so he might still think of this as looking out to sea rather than looking across the bay. There is another factor to consider (thanks to Charles Evans for this one). In a literary sense the name "Tinworth" is almost certainly a reference to the story Safer Than Love by Margery Allingham, of whose detective fiction Rowling is a fan. But in-universe it surely indicates that Tinworth is connected to the tin trade, Cornwall's most famous industry. Now, none of the places I have proposed, from Portloe to Lizard Point, is very close to a tin mine - those tend to be towards the north and west of Cornwall. However, the mouth of the River Helford opens into the sea three miles north of Porthoustock, and the Helford used to be a major centre for tin exports, presumably brought from the mines a few miles inland near Helston and points north and west. 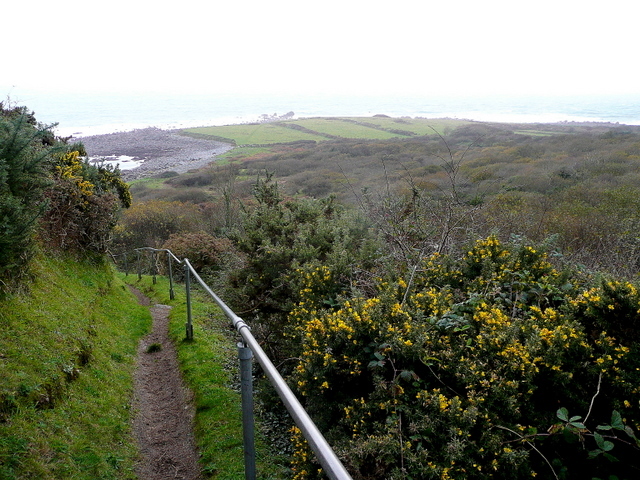 There's a road from Helston to Coverack, with a branch going north to St Keverne just inland from Porthoustock. This makes it most likely that Tinworth is on the strip from Porthoustock to Coverack, and is a small port through which tin was exported in the Dark Ages. Shell Cottage itself is meant to be on top of a cliff with water right at its foot, not standing on a beach as it is in the films. We know it is on top of the cliff, not partway up it, because it has a "cliff-top" garden and there's no suggestion that the garden is higher than the house. There is a wall between the garden and the cliff, low enough for a tallish boy to look over, and the garden has bushes at the end, red earth, and flowerbeds edged with white stones. The cottage walls are whitewashed and have shells embedded in them, apparently also whitewashed over, not brown as in the films. 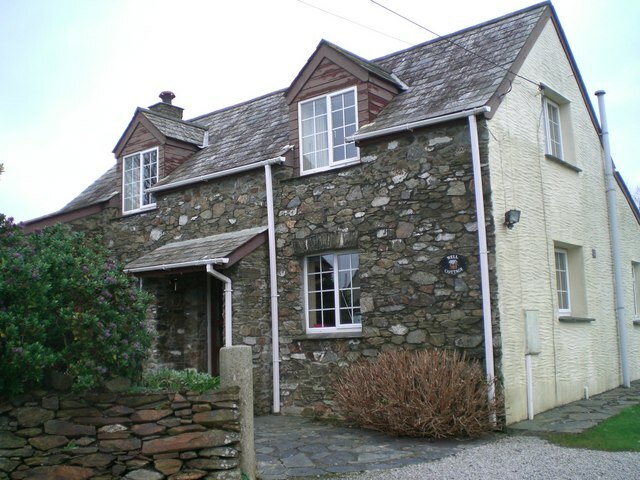 Its overall appearance presumably conforms to what JK Rowling would expect a Cornish cottage to look like - i.e. nothing like the Warner Brothers' version. The cottage has both a front and a back door: the back door seems to open into the kitchen and we know the kitchen faces towards the sea and away from the garden, so the front door must face landward, in or next to the garden, and there must be a path between the back door and the cliff's edge for the back door to open onto safely. Since the cliff is at the back of the house and the garden at the front, and yet there is a wall between the garden and the cliff, we know the garden must wrap round at least one side of the house. The house is described as light and airy and is also supposed to be "tiny", but it has three bedrooms even the smallest of which is big enough to sleep two people, a kitchen large enough to contain a table big enough for several people to sit round, and apparently a separate sitting/dining room with another fair-sized table plus whatever seating is required to qualify it as a sitting room, as well as a living room with sofa, so it's only tiny by the standards of somebody who can afford a big house. It is difficult, in fact, to square the idea of there being only three rooms upstairs, one of them very small, with the size of the downstairs but perhaps the upper storey is in the eaves, as it is at Well Cottage, and is therefore smaller than the ground floor. This would mean that the bedrooms had sloping ceilings on the window sides. Harry, Ron and Hermione followed Bill up the steep stairs, on to a small landing. Three doors led off it. 'In here,' said Bill, opening the door to his and Fleur's room. It, too, had a view of the sea, now flecked with gold in the sunrise. Harry moved to the window, turned his back on the spectacular view and waited, his arms folded, his scar prickling. Hermione took the chair beside the dressing table; Ron sat on the arm. Ron and Hermione looked bewildered, but impressed, as they followed him across the little landing and knocked upon the door opposite Bill and Fleur's. A weak 'Come in!' answered them. [cut] The kitchen door opened behind them; Fleur was trying to bring through more empty goblets. Downstairs, the door from the garden leads into a small hall. Both the living room and the kitchen open off this hall, the living room being carpeted and the hall and kitchen apparently not (from the hall, Harry can see into the living room but he bypasses it and enters the kitchen from the hall, in order not to get mud on the carpet). The living room is described as light and pretty, with a fireplace in use. The kitchen is supposed to be small but is big enough to contain a table around which at least four people can sit, and it has a sink under a window which faces the sea and the sunrise. Also in the hall is the foot of a steep flight of stairs: the door to the kitchen is in between these stairs and the door to the garden. The stairs lead to a small landing with three doors off it. There are two largish bedrooms, in one of which Bill and Fleur sleep (presumably in a double bed) and in the other Ollivander and Griphook, in separate beds. There is a third, small bedroom described as cupboard-like, but big enough for Hermione and Luna to sleep there. If it's very small they may be sharing a bed (Ron, Dean and Harry make do with the living room sofa). This small bedroom has red curtains. Bill and Fleur's room overlooks the sea. Griphook refers to seeing Dobby's grave - on the inland side of the cottage - from the room of the bedroom next to Bill and Fleur's, and since he has been sharing a room with Ollivander and that room overlooks Dobby's grave, presumably this is the room he means. Yet, the doors of the two rooms are opposite each other. In order to be both next to and opposite each other their shape must be quite complex. We do not know in which direction the small room faces. It is not made clear whether the sitting/dining room and the living room are the same room or not. However, we know both the living room and the kitchen have doors into the hall, and the kitchen also apparently has a door directly into the sitting/dining room. Either the rooms are a very odd shape or the sitting room and kitchen are on the same side of the hall. If the sitting room and living room were one and the same we would have two rooms on one side of the hall and nothing on the other, unless it's the bathroom, which would make the building very lopsided. So we can assume they probably are not the same and that the sitting/dining room and kitchen are on one side of the hall, and the living room and putative bathroom on the other. The sitting/dining room has a window looking towards the garden, a fireplace and next to it a large if somewhat crammed-in table, at least big enough for Fleur, Harry, Ron, Hermione, Griphook, Luna and Dean to sit round. A gentleman called Scott Keane, who has made a study of Cornish architecture, has suggested a more complicated but more authentically Cornish layout. I have reproduced his design exactly here, except that I changed the layout of the landing slightly to make sure that the small bedroom would be suitably cupboard-like. In this case the upper floor has the same floor-area as the ground floor, except for the section housing the bathroom, but on the outer sides the upper floor has sloping ceilings which extend down to the low-set windows. The sole problem with this design is the passage which states that "Harry caught a glimpse of Bill, Fleur, Luna and Dean sitting at the table in the kitchen [cut] he merely nodded to them, and continued into the garden, Ron and Hermione behind him. The reddish mound of earth that covered Dobby lay ahead," [DH ch. #24; p. 403] In Scott's design, if they go out of the door by the kitchen, from the hallway, then they are facing out to sea and Dobby's grave is more or less behind them on the far side of the house - since we know it is in the opposite direction from the cliff, or at least that it is visible from a window facing in the opposite direction from the cliff. 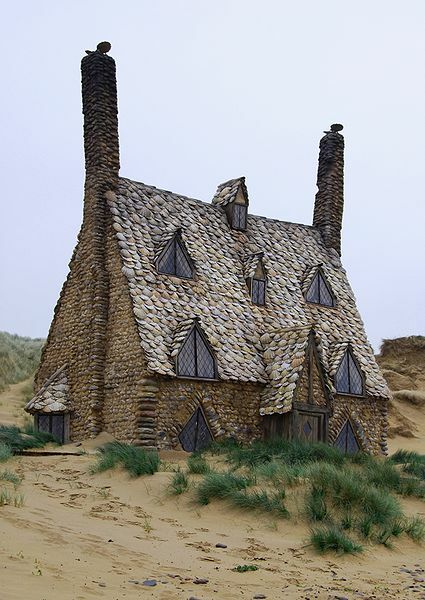 To make this design work, then we have to assume either that they went out of the hall door, facing the cliff, and then they walked along the back of the cottage and turned a corner before we get to "The reddish mound of earth that covered Dobby lay ahead"; or that from the kitchen they walked through the sitting-room and out of the front door. Both of these are possible, however, and in all other respects this design fits perfectly and gives a convincing picture of what JK might have had in mind. We can imagine that there would be some sort of shell decoration - perhaps bands of cockleshells set in round the doors and windows. Tinworth is on or near the south-west coast of Cornwall, somewhere between St Austell and Lizard Point, with Shell Cottage being at the top of a cliff somewhere near the village. 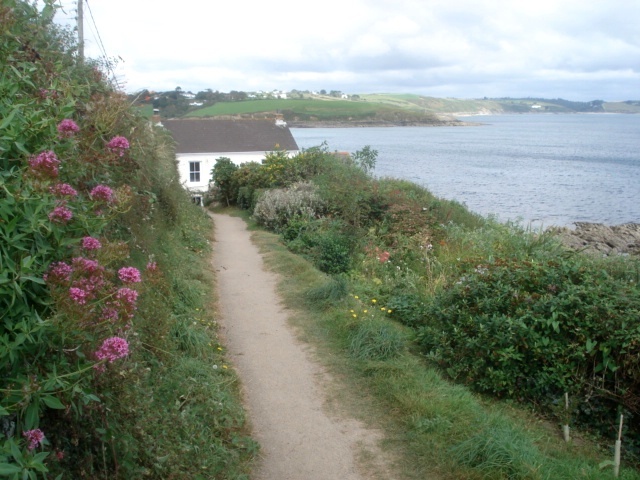 It might be a fictional version of the real-life village of Trewithian, between Falmouth and Mevagissey, but because of the likely association of the name Tinworth with the tin trade it's more likely to be on the wooded shelf between land and sea which lies about a mile south of Porthoustock and eight miles south of Falmouth. It is probably a small port which used to export tin brought overland from the Helston area. Shell Cottage itself is situated on top of a cliff which has the sea coming right up to its foot, and is small, although big enough to have three bedrooms. It has two storeys, the upper storey probably being at least partially within the roof of the house and having ceilings which slope down towards the windows. The exterior walls are studded or edged with shells which have been whitewashed over. The rear of the house and the back door from the kitchen face towards the sea and broadly east, and the front face faces inland. There is a garden at the front and at least one side of the house, with a lowish wall between it and the cliff. The cottage is not right at the cliff's edge: at the very least there must be a path between it and the edge, to enable access via the back door. N.B. Tinworth is also the name of a fictional Cornish village in Safer Than Love, a murder-mystery set in a boys' boarding school and written by the "Golden Age" detective-fiction writer Margery Allingham. This is presumably a deliberate literary in-joke, since JK Rowling has stated that she is a big fan of Allingham's work.